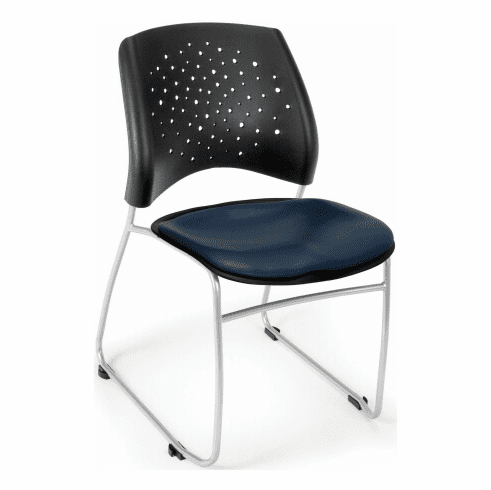 These sled base stacking chairs are from the OFM Stars collection and feature a durable, easy to clean vinyl upholstery available in your choice of (5) different colors. Other features include an ergonomic triple curved seat design, built-in lumbar support, silver powder coat frame finish and a stable sled base for easier movement over carpet. These chairs are stackable up to 6 high without a dolly or 16-20 high with the optional transport dolly. Dimensions: Seat Size: 18.5"W x 17.5"D. Back Size: 19"W x 16"H. Seat Height: 18.25"H. Overall: 32"H x 20.75"W x 23.5"D. Weight: 12 lbs. ea. Limited lifetime warranty from OFM.